The US Federal government offers a credit against taxes owed for new EV purchases. For Tesla Q1 & Q2 2019 this is $37500, and goes down in Q3 & Q4 to $1850. 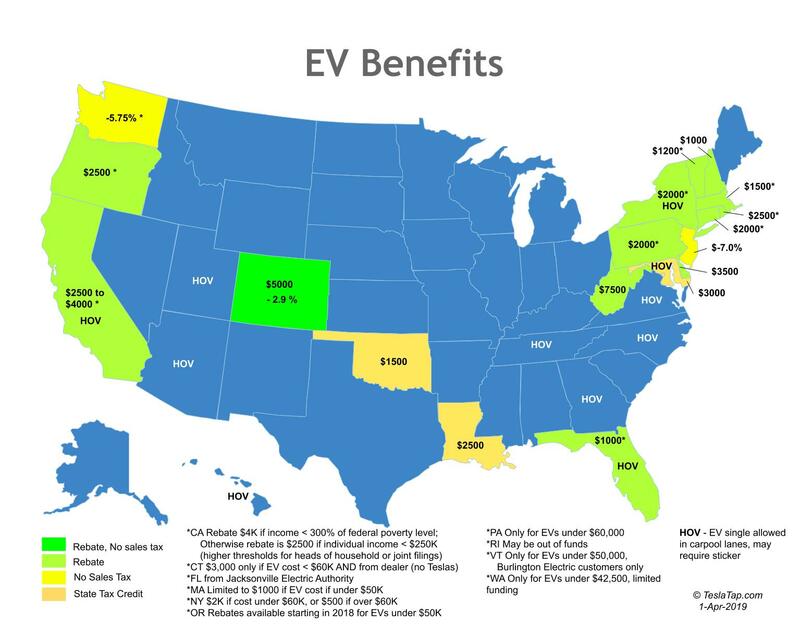 Quite a few states offer additional benefits for the Tesla owner, which may include a cash rebate, a deduction on taxes owed, no sales tax or a credit against taxes owed. 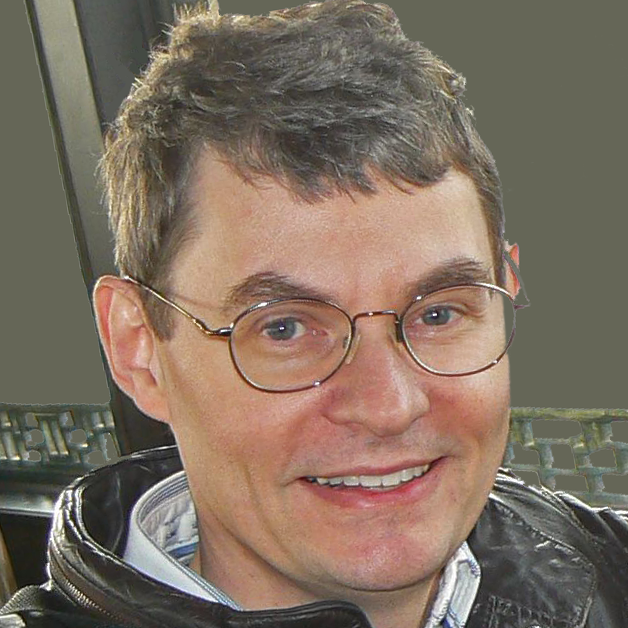 A number of states also allow an EV with a single person to travel in the HOV – High Occupancy Vehicle lanes (also called Carpool or HOT- High Occupancy Traffic lanes). Check with your state for the latest details and funding. The FTC and most states are supportive of Tesla’s efforts, but a few have anti-consumer laws to make it difficult to evaluate and test drive a Tesla. 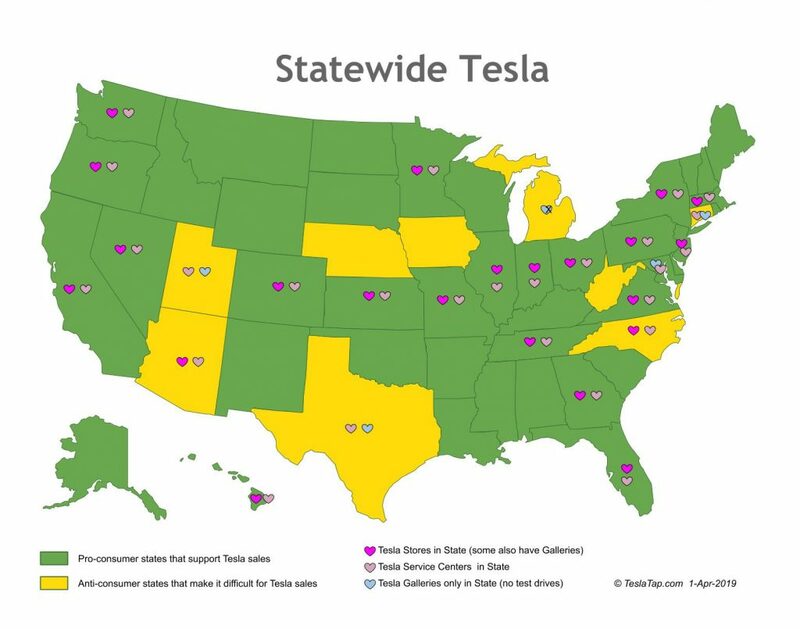 Here’s the status of each state and which states currently have Tesla stores, galleries or service centers. Galleries typically have cars you can view or sit in. In the states with restrictive laws might not allow a test drive or verbally quote a price (although everyone really gets a price online anyway). Superchargers locations and additional stalls at existing locations are constantly being added around the world. Currently only 3 states do not have Superchargers. 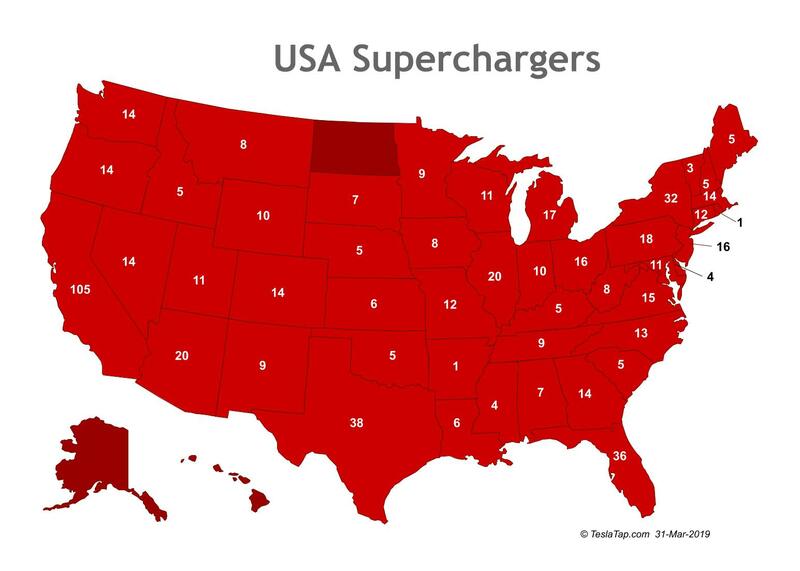 This map shows the Supercharger location count in each state as of the end of March 2019. California currently leads with 1467 Supercharger stalls. Across the USA there are now 632 locations with a total of 5802 stalls. Individual locations range from 2 to 40 stalls. Click on any map for a larger clearer view. We will attempt to update these charts as they change in the future, but consider it a snapshot in time with many more stores, service centers and Superchargers coming on-line in most states. Thanks! The map is now updated. Why was Iowa left out of the Tesla anti-consumer states? They don’t even allow test drives! Missed it before. I just updated it with Iowa now. Thanks!